The Affiliate Module is available for online stores that would like to sell products through Affiliate Salespeople. This module comes complete with the online Affiliate Application, Affiliate Approval System and Affiliate Commission Tracking System with Real-Time Reporting. People who wish to become Affiliates of your online store will complete the online application (provided with the module). This application is sent to the store administator via email for review and approval. Upon reviewing the application, the store administrator will provide the commission rate applicable to the affiliate who is applying. Commission rates can be set as a percentage of the sale, or a flat amount for each purchase referred by the affiliate. Once approved, the affiliate will simply provide a link to your website that contains the Affiliate ID. All traffic and sales from the Affiliate is logged and can be accessed by the Affiliate by logging into their Affiliate account in your online store. When the store receives an order that was referred by an Affiliate, the order is tagged with that Affiliate's ID. The store administrator can cancel or edit any commissions that have been assigned to any orders that are canceled or voided, preventing a payout of commissions on orders that do not result in a completed sale. The Affiliate Module also provides a convenient commission batch report that can be programmed to run weekly, monthly, quarterly, or can be executed manually at any time. These reports specify the Affiliate sales commissions owed by the store, making it easy to pay your Affiliates as needed. 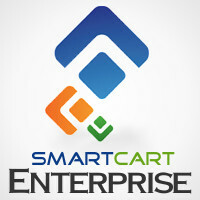 Enterprise This module is included with SmartCart Enterprise service.